Decorative sand can pose special challenges during the setup phase of an aquascape and also during maintenance work. If you keep shrimps in your tank you will soon find that they have a tendency to flatten slanting sand areas when grazing, and that they carry small gravel or soil granules onto the sandy areas during their unrelenting quest for food. With a sand flattener, you can restore the original structures and remove things that do not belong in these areas. Sand flatteners are somewhat uncommon tools, but have proven to be highly useful during routine maintenance work. 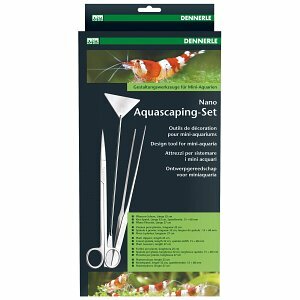 In aquascaping, a spatula for smoothing sand and gravel is called sand flattener. 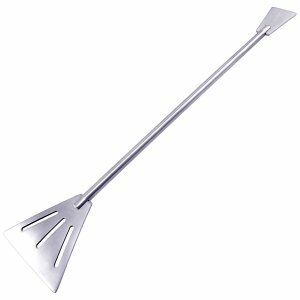 This spatula is a useful tool for modeling and smoothing substrates such as sand, soil or gravel in an aquarium or aquascape. Such substrate modeling can be done as part of a new layout, but might also be necessary during ongoing operation. Especially in aquariums with shrimp inhabitants or other ground-ravaging animals, laboriously designed soil slopes or hills are often leveled over time. This is often the case when areas are not planted, because then the roots of the aquarium plants won't be there to keep the soil particles together. Sand zones or paths modelled in sand are predestined to fall victim to this. In the transitional areas between sand and substrate it may happen, that due to the waterflow or some overambiguous shrimp, singular kernels of soil or small stones may end up in the sandy zones, visually defacing them. Our article Sand and soil offers some great tips on how to keep the substrates seperated from each other. With a sand flattener, substrate structures in the aquarium can be restored to their original state. Even during operation, this tool can be used to restore hills or slopes and smooth out floor areas again. For this purpose, sand flatteners often have two differently-sized spatulas. 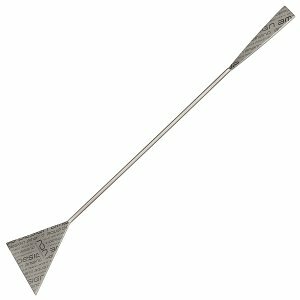 Where the wider area on one end of the spatula works well for moving larger masses of substrate, the end with the smaller spatula is perfect to flesh out details in the substrate or small sandy paths in more detail.